Chairman Lee Sang-Ki (third from right) of Asian Journalists Association (AJA) poses with AJA Vice Chairman Kang Seok-Jae (second from right), Chairman Chung Nam-Kee of Korea Press Foundation (center), and other AJA members. 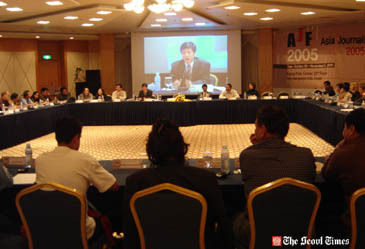 SEOUL (Nov. 5, 2005) — The Asian Journalists Association has adopted its charter and appointed two of its five vice presidents. With the approval of its charter, the AJA plans to announce the final lineup of its Executive Council members as early as possible. At its plenary session on Jeju Island on Nov. 2, participants of the AJA approved the AJA Charter, which was drafted by several founding members of the AJA. The plenary session also empowered AJA President Lee Sang-ki to appoint two of its five vice presidents, as stipulated in the AJA Charter. The two appointed were Ivan Lim Sin Chin of Singapore, a former president of the Confederation of the ASEAN Journalists (CAJ), and Kang Seok-jae of Korea, the first secretary general of the AJA. AJA Vice Chairman Kang Seok-Jae (seen on screen) leads AJA seminar held on Jeju Island. The charter states that the Executive Council shall be composed of the president, vice presidents (up to five), the secretary general, the treasurer and committee chairmen (up to five). The AJA shall have five committees on journalists safety and solidarity, international exchange and networking, new media, professional development and projects, and membership and discipline, according to the charter. The AJA was launched as the first Asia-wide regional journalist organization in 2004 during the 2004 East Asia Journalists Forum. The AJA was aimed to promote and uphold greater press freedom and solidarity among journalists in the Asia-Pacific region. 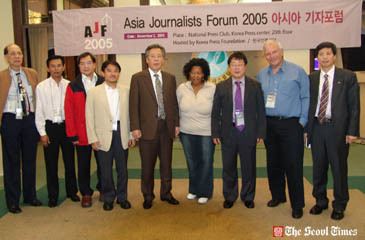 Participants in the 2004 East Asia Journalists Forum, participants unanimously selected Lee Sang-ki, president of the Journalists Association of Korea (JAK), as the first president of the AJA, and Kang Seok-jae as the first secretary general of the AJA. The AJA plenary session highlighted the program of the Asia Journalists Forum, which kicked off on Oct. 30 and concluded on Nov. 5. The forum, organized by the Journalists Association of Korea, changed its name from the previous East Asia Journalists Forum to the Asia Journalists Forum. 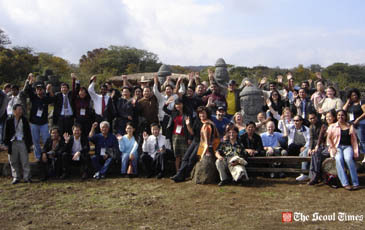 The 2005 Asia Journalists Forum drew 58 journalists from 24 foreign countries and region and scores of Korean journalists. 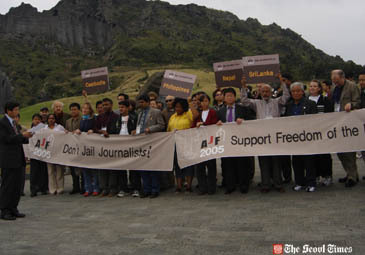 The countries which sent their journalists for the first time to the 2005 Seoul forum were Austria, Israel, Kirgistan, Nepal, South Africa, Sri Lanka, Switzerland, and Thailand. The forum dates back to 2003, when it drew about 40 journalists from 14 countries and region. The second forum attracted about 60 journalists from 20 countries and region. Prior to the AJA plenary session, there was a rally on Seongsanilchulbong Peak on Jeju Island to show the participants' solidarity for journalists in Nepal. Chairman Lee Sang-Ki (4th from right) of Asian Journalists Association (AJA) poses with other AJA members on Jeju Island. At the rally, participants unanimously adopted a resolution on Nepal press calling on the Nepalese government to promptly release the four journalists still under detention and the reinstatement of about 2000 journalists retrenched from their jobs. The resolution also urged the Nepalese government to restore the rights of journalists to report freely and professionally, while asking the government to promptly and responsibly to protect and ensure the safety of journalists. During the 2004 East Asia Journalists Forum, participants unanimously adopted a resolution on safety of journalists, which seeks to address the increasing violence against journalists across Asia. On the second day of the 2005 Asia Journalists Forum, on Nov. 1 in Seoul, participants unanimously adopted a resolution on the ongoing six-party talks on the North Korean nuclear issue. Participants also expressed their support for the efforts of the Journalists Association of Korea to host the 2007 Congress of the International Federation of Journalists (IFJ) in Seoul. 1. Fifty-eight journalists from 24 foreign countries and regions and Korean journalists attending the 2005 Asia Journalists Forum and Plenary Session of the Asia Journalists Association in Seoul and Jeju from Oct. 30 to Nov. 5 rounded off their sessions with fresh commitments to join hands in protecting and expanding the press freedom, safety and rights of journalists. 2. They passed two resolutions, one reaffirming the key role of the media in giving proper and positive coverage of the ongoing six-party talks on the North Korea nuclear issue and another supporting Nepalese journalists in their fight for press freedom. 3. At the AJA plenary session, the journalists, after deliberating at length on the draft AJA Charter, adopt the constitution. At the same time, they also came up with several suggestions for fine-tuning the Charter, including adopting by-laws that will spell out the responsibilities and accountability of office-holderss and members as well as clarifying the membership status of journalists and media organizations. 4. The meeting endorsed the AJA President Lee Sang-Ki's appointment of two of five vic presidents, namely Kang Seok-jae of Korea and Ivan Lim Sin Chin of Singapore. 5. In a show of confidence in the new organization, delegates from Nepal, Sri Lanka, Thailand, Kirgistan, Israel, South Africa, Austria, and Switzerland, which taking part in the forum for the first time, agreed to formally join AJA as members. The representatives of several national media associations also agreed to join AJA, pending approval by their respective national associations. 6. Acting on the Charter's provisions, AJA will be appointing chairmen to head committees on Safety and Solidarity, Membership and Discipline, International Exchange and Networking, Professional Development and Projects, and New Media. 7. AJA will work out programs with member countries, including training of Mongolian journalists, and general assistance to journalists in Cambodia, Nepal and South Africa. 8. As part of publicizing its collective identity, AJA will be organizing contests for the AJA logo and the AJA song. 9. In an effort to highlight journalists' mission in furthering the cause of peace, it was decided that AJA will look into presenting Peace Awards in addition to organizing workshops on Peace Journalism. 10. AJA delegates pledges to work with the Journalists Association of Korea to convene the Asia Journalists Forum in 2006 and supports JAK's initiative to host the 2007 Congress of the International Federation of Journalists in Seoul.